It’s a once-in-a-lifetime opportunity to do a trek like that and raising money for a great cause like the Foundation made it even more special. Two adventurous groups have managed to raise a combined total of $85,000 to support the work of the Crows Children’s Foundation. 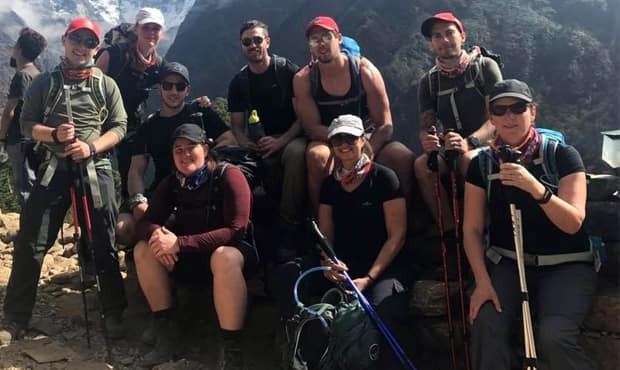 Crows players Kyle Hartigan and Sarah Perkins were part of a group of 12 that trekked to Base Camp Everest in October and raised $55,000 to further the Foundation’s work helping kids in need. As well as walking around 160 kilometres up to 5600m altitude, the group visited a village outside of Kathmandu to help rebuild a school devastated by an earthquake in 2015. Perkins said the trek was one of the best experiences of her life. “It’s a once-in-a-lifetime opportunity to do a trek like that and raising money for a great cause like the Foundation made it even more special,” she said. A group of keen cyclists, including Crows Assistant Coach Matthew Clarke and Ambassador and Olympic cyclist Annette Edmondson, participated in this year’s Redline Classic bike ride and also raised an impressive $30,000 for the Foundation. Across three days the 14 riders and a team of support crew travelled from Adelaide to Victor Harbour, Strathalbyn and through McLaren Vale as part of the annual fundraising event. Crows Children’s Foundation Manager Louise McDonald thanked the trekkers, riders and their supporters for their efforts. “The Foundation and wider Crows community is very grateful for these fundraising efforts,” McDonald said.